It was with a little nervous trepidation that I stepped up to the bar at Fish Story to tap my first keg of wine. 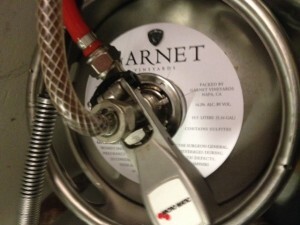 I had invited 25 co-workers and close friends to help me tap Garnet Vineyard’s first ever Pinot Noir in a keg, which also happens to be my first ever wine in the keg. About a month or so ago, I was contemplating the wine kegging process and learned a lot about how the actual kegging process workd. 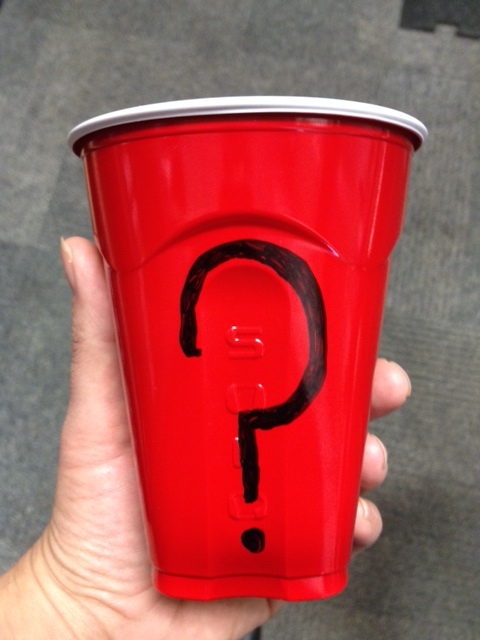 Now that we’ve since put the wine in the kegs themselves, my questions have turned to other quarters. 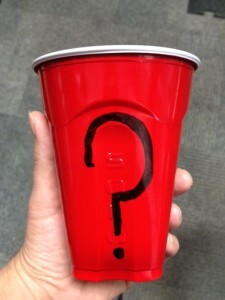 How would a wine-serving process and premise so very different from the traditional bottle deliver? Would the nose, color, taste or texture of my precious Pinot Noir be different? Most importantly, would it be good? Heck- would it be great? I had to draw a glass, in this private moment before everyone showed up, to see for myself. Happily, I can report, I tapped a keg and I liked it! Now I wasn’t really too worried, knowing that Free Flow Wines (the company that kegged up the wine for me) and Gwen Larson’s team at Fish Story were all experienced veterans in this wildly-growing world of wine-on-tap. 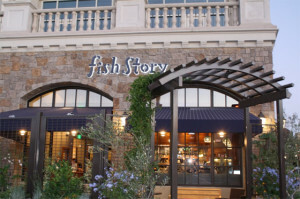 The Lark Creek Restaurant Group, of which Fish Story is a member, was an early adopter of the wine on tap movement and Free Flow has become the go-to partner for quality-conscious winemakers getting their wine into kegs. I was the inexperienced one this time, and I’m glad to report (all my kegger invitees back me up, here) that the wine tasted great. My Assistant Winemaker, Barbara and I had delivered the wine to Free Flow’s south-Napa winery/kegging facility about a month prior and had watched with fascination as their precision-engineered machine (custom made in Germany- by a beer company!) cleaned, sanitized and then filled rows of gleaming silver kegs with our Pinot Noir. Doing wine in a keg is an interesting decision for a winery to make. I had heard about the much “greener” aspect of the technology and anecdotally from hearing about the process understood how a layer of inert argon gas can protect flavors of the wine. Naturally I was extremely excited to guarantee that what arrived in a restaurant customer’s glass was the very best I could offer and wasn’t the oxidized dregs of a half-open bottle from yesterday. Who wants to subject the wine-drinking public to that- yuck! But what about the cost savings? Isn’t it cheaper for wineries to do wine in kegs? Guaranteed freshest wine from the 1st glass to last! So how did it taste? Pretty darn great. From what I can tell, one of the coolest benefits of wine-in-a-keg is no bottle shock. 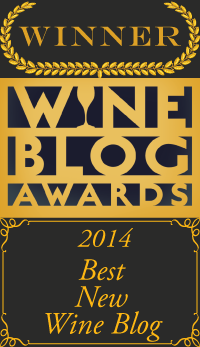 I know, I know, it’s anecdotal at this point( and what is bottle shock anyway? -more on that in future blog posts, I promise) but as I typically wait at least three months after I bottle a wine to let it “settle down” and “get over itself” I was thrilled that, a month after kegging, the wine tasted exactly as I wanted it to. Judging by how low we tapped that keg for #Wine Wednesday, I think it tasted exactly as everyone else wanted it to as well! Gwen and her team were flinging cute full and half-sized carafes left and right (she does 750 ml, 375 ml and glass-sized pours) as we dove into the sliders and sushi, snapping pictures and catching up. 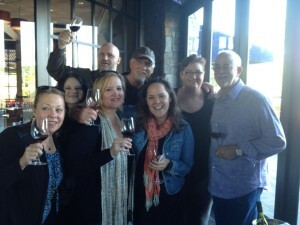 It was a fun time to hoist a glass of wine-on-tap 2012 Garnet Monterey Pinot Noir….and to get ready for our next keg run! 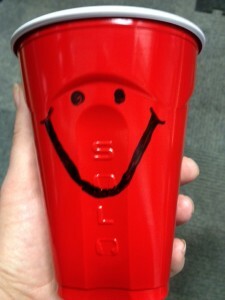 Red Solo Cup liked it too! Please visit our friends at Fish Story in downtown Napa! Say hi to Chef Scott and Beverage Director Gwen Larson, whose staff gave us a keggin’ good time. 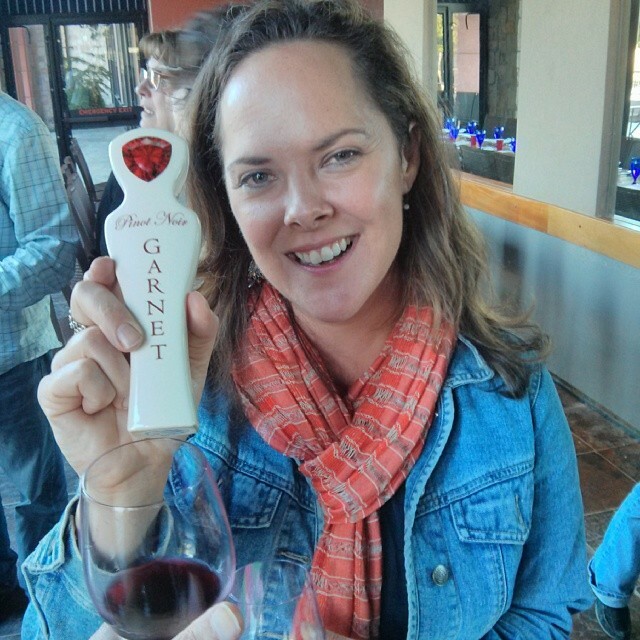 Alison Crowe is the Winemaker at Garnet Vineyards. Find her on www.facebook.com/GarnetVineyards, on Instagram and on Twitter @GarnetVineyards.